A move to e-invoicing could potentially transform the economy to the tune of $7-$10 billion a year according to the Federal Government. e-invoicing means the automated exchange and processing of invoice-related documents between suppliers and buyers in a structured electronic or digital format. The ATO has estimated that only about 10-15% of invoices sent in Australia currently use e-invoicing, noting there are currently around 500-800 different ERP/accounting systems in use in Australia. About one billion invoices are sent between Australian businesses each year, compared with about 130 million superannuation contribution messages sent using SuperStream. Following the Budget, the Government commenced a joint private-public sector detailed cost and benefit study on widespread Government adoption. The ATO has estimated that there could be savings of $3 billion for government agencies alone. Following on from this, the joint private-public sector council has approved a framework for implementation of national standards for the processing of e-invoices. The framework prescribes the use of universal business language (UBL) XML specification for messaging and eBMS 3.0 AS4 standard for transport. 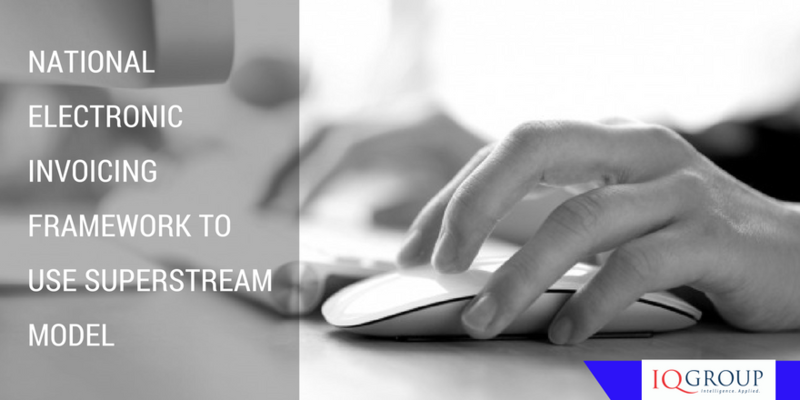 This is the Standard required by SuperStream for employers to make superannuation contributions using e-commerce. What’s more, the implementation model currently proposes a “4 corner model” whereby invoices are sent by the seller to the receiver (buyer) via sending and receiving gateways. This structure and associated technical details are being looked at by a technical working group. The successful implementation of SuperStream has been a driving factor in this area, and it is noteworthy that the ATO has been a key participant in this process as well. Gateways and other organisations with SuperStream expertise and capabilities are also involved in the process, and they will be able to leverage off their SuperStream learnings. The small business community, as represented through the Council of Small Business Australia (CoSBA), were at best ambivalent to the introduction of SuperStream – although most small businesses are now SuperStream compliant. However, they are far more enthusiastic about e-invoicing. This week’s blog is a re-published post from The Conversation, an independent source of news and views, sourced from the academic and research community. 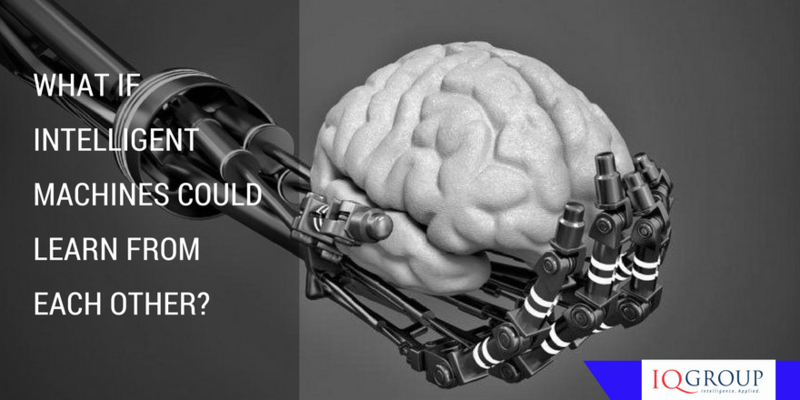 Today’s blog takes a look at “What if Intelligent Machines could learn from each other?” In this age of ‘robo’ it’s food for thought. Here is what Raja Jurdak, Research Group Leader, Distributed Sensing Systems, CSIRO believes we could expect. There’s a potential disconnect between how governments of all persuasions say they’re going to implement change to super and how they actually go about it. Simple, with time to consult is their theory; potentially complicated, with possibly shorter consultation time is their practice. What the Government is doing with the Budget super measures is certainly food for thought. The Government accepted the recommendation of the 2015 Final System Inquiry to give industry appropriate time to implement regulatory change however this may not be the reality for this round of changes. The shorter time than expected the super industry is being given to implement complex regulatory change may lead to a range of unplanned challenges, including the risk of increased costs, complex outcomes and unanticipated speed bumps – and this may mean less than optimal outcomes for Australian super fund members. Immediately after the Federal Budget, the Government went to the election taking a raft of superannuation policies with them; with super having a high focus throughout the campaign. After the Federal Election, the re-elected Government undertook the process of negotiating with interested parties, resulting in a staggered release of draft legislation. Removing the work test for those aged 65-74. However, following negotiations with the backbench, there will be no changes to the work test for those aged 65-74, and is delaying the catch up provisions (see below) until 1 July 2018. In an unusual scenario, the Government only gave eight days for the consultation on this package of legislation. The nine day consultation period on this has just closed, with the Government providing draft regulations to accompany the draft legislation. This is not something to celebrate because the explanation of the $1.6 million transfer balance cap alone takes 64 pages, and that’s followed by 37 pages of associated draft legislation. The complexity of the legislation will be reflected in the complexity of its implementation. The third, and probably final, stage will cover the new $100,000 annual after-tax contributions cap that replaces the previously announced – but now withdrawn – $500,000 lifetime cap. Draft legislation on this is expected in the next fortnight. The Government intends to introduce all of this legislation to Parliament during the current session, that is, 1 December, and hopes to get it to the Senate by then. Almost all of the legislation is scheduled to come into effect from 1 July 2017. Given that the legislation also has to pass through the Senate, may be referred to a Senate committee, and the positions of the ALP, Greens and many Senate cross-benchers may challenge these bills; the time frames are potentially becoming very tight, and may pose a challenge for the industry, software developers and the ATO to successfully implement process and system changes. 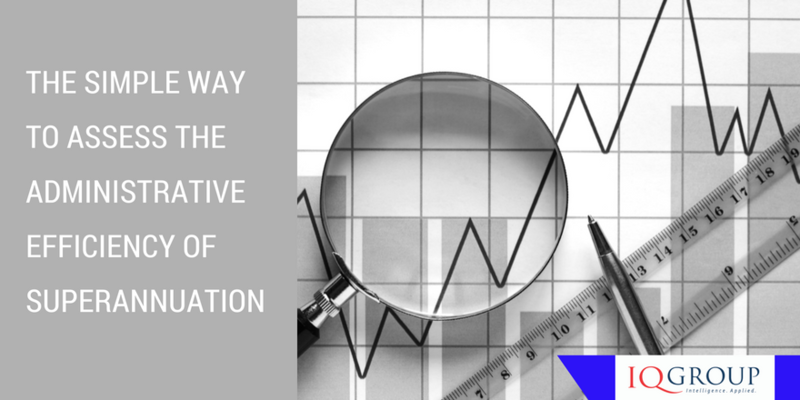 In a previous blog, I asked if the Productivity Commission had underplayed the importance of cost efficiency in superannuation in its review of competitiveness and efficiency in superannuation. IQ Group didn’t just leave it there, but has written a submission to the Productivity Commission showing how back office efficiency and cost efficiency can be given a higher priority in assessing the efficiency of superannuation using a simple model. The Productivity Commission identified 84 items of evidence required for the system assessment, and concludes that 43 of these items require new data sets. We think this both overestimates the usability of the 41 existing items and underestimates the administrative burden and the design and consistency challenges in gathering the 43 new data sets. IQ Group has suggested focusing on a small number of basic efficiency measures, and proposed basic indicators for cost efficient superannuation administration. The core elements for administration are record-keeping and member details, contribution processing, and rollovers and benefits. The efficiency of these can be assessed by their cost, timeliness, accuracy, and usefulness to a member. This may seem basic but this information is not collected, collated or assessed on a standardised basis across the industry. A lot of information is collected through APRA data reporting but not this information. 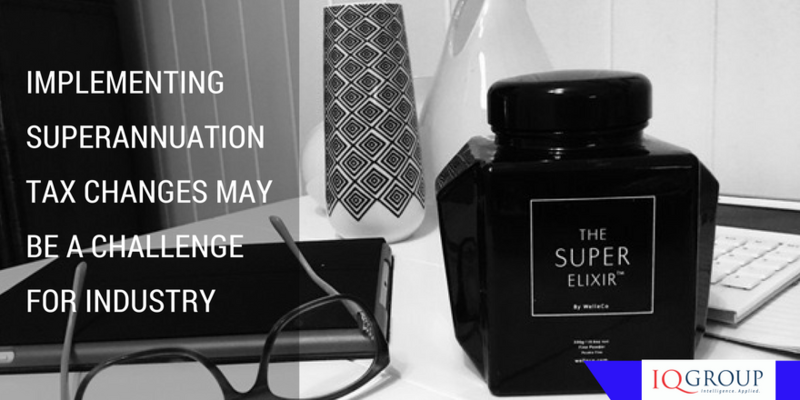 Despite the introduction of the three day transaction processing requirement through SuperStream, there are widely differing levels of transactional performance in superannuation, and this is likely to continue – and measurement of SuperStream efficiency itself is not standardised. We proposed having system-wide benchmarks together with a comprehensive and focused set of functional level benchmarks identified above (eg, timeliness of benefit payments). This model can built from a baseline understanding of existing best practice examples from throughout the superannuation industry, and across administration. Not only will this potentially help drive cost efficiency and cost minimisation, it would also contribute to promoting competition, as funds could ideally promote their ‘best run’ status. The use of such a potential framework and standard measurement would allow consumers to see that one of the most efficient levels for service provision may be on a mass market basis, but will also allow them to see the premium cost for tailoring to meet their particular needs. The framework could be developed for each of main superannuation product types, to avoid the risk of just setting a lowest common denominator. This would also give an informed retail consumer the opportunity to better understand the reason for differences between products and product types, and whether or not it is sufficient to justify any additional cost. This approach has the value of potentially greatly increasing fee and cost transparency in superannuation, and could have the systemic benefit of encouraging providers to concentrate on cost minimisation just as much as return maximisation. The Productivity Commission report is also already making a positive contribution to the debate about the efficiency of superannuation, and IQ Group looks forward to being part of that debate.